From the top down: Kana Ellis, Northport, Ala., Third Team; Gabriel Walvatne, Mobile, Ala., Third Team; Laura Medders, Thomasville, Ga., Honorable Mention; Allison Kellogg, Madison, Miss., Third Team; Sarah Adair, Hartselle, Ala., First Team. TUSCALOOSA, Ala. – Five students from The University of Alabama have been named to this year’s USA Today All-USA College Academic Team, the largest number of students from UA ever named to the USA Today team in one year. UA students garnered the most awards of any college or university this year, claiming five of 83 spots on the list. The ranking places the UA students among some of the nation’s top college and university students. Named to the First Team was Sarah Adair, a senior microbiology major from Hartselle, who hopes to pursue biomedical research. Three students were named to the Third Team: Kana Ellis, a senior psychology major from Northport, who plans to attend law school; Allison Kellogg, a senior dance major from Madison, Miss., who hopes to pursue a career in the performing arts; and Gabriel Walvatne, a senior interdisciplinary studies major from Mobile, who plans to attend law school. Laura Medders, a senior journalism major from Thomasville, Ga., who wants to be involved with urban community development, received Honorable Mention. Each year, USA Today selects the “best of the best,” what it considers the top 20 students in the nation for its First Team. USA Today also includes Second and Third teams and Honorable Mentions in its “All American Academic Team.” Students are chosen for their grades, awards and activities, leadership roles and their ability to use their academic skills outside the classroom. Since 1991, The University of Alabama has placed 22 students on the list. The state of Alabama was well represented on this year’s list. In addition to the UA students, an Auburn University student was named to the First Team and a student at the University of Alabama at Birmingham was named to the Third Team. Adair is set to graduate in May 2003. During her time at UA she has received many of the top honors students across the United States can receive. In the spring of 2001 she was named a Barry Goldwater Scholar, and received one of 302 scholarships for potential as a future scientist. In the fall of 2001, she received a Phi Kappa Phi Research Award, a research grant to help fund her research in the Caldwell lab at UA. This award is for undergraduate research. In the spring of 2002, Adair received the McWane Foundation Research Fellowship to begin funding her Parkinson’s research. Just one of these UA fellowships is given each year for undergraduate research. She’s a member and president of Beta Beta Beta, the biological honor society and a member of Phi Beta Kappa, the oldest national honor society for recognition of academic achievement in the arts and sciences. She’s also active in the community. Two nights a week for the past three years she has volunteered for the Good Samaritan clinic in Tuscaloosa – a free clinic that serves patients who have no insurance and limited income. She has become licensed in the state of Alabama as a pharmacy technician. Adair has been actively involved in research throughout her college career. In her sophomore year she was named a Howard Hughes Medical Institute Summer Research Intern, a full year earlier than most students at UA. She has produced some remarkable data in the field of neuroscience and currently is involved in a project on Parkinson’s research, working with UA biology professor Guy Caldwell. This past December she presented a poster at the American Society of Cell Biology in San Francisco for her work on Parkinson’s disease. Adair has generated an animal model that will allow screening for environmental and genetic factors that cause Parkinson’s. Her research shows much promise and she hopes to continue her work to help find a cure for Parkinson’s, which affects approximately 1.5 million Americans. This bright, talented and deserving young woman has achieved more, still. She founded a student journal to help students publish their own scientific research; she testified before an Environmental Protection Agency subcommittee on the pollution of Alabama’s groundwater supply; and was the president of the Blount Student Association in the fall of 2000. 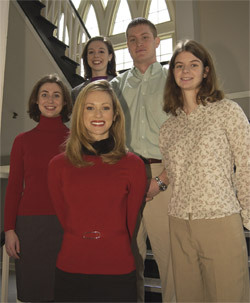 The association is part of the Blount Undergraduate Initiative, a four-year liberal arts program at UA. During her time at the Capstone, Ellis has been very involved in the honors programs and has received many awards and honors, among them: National Honors Student of the Year, 2002; William P. Bloom Scholarship Award , 2002, one of four UA Premier Awards, the University’s most prestigious awards; Henry Pettus Randall III Scholarship, 2002, an award for most outstanding research project for the year; XXXI Amanda Taylor Watson Scholarship, 2002, given to the top XXXI student; Phi Beta Kappa, 2002 (initiated junior year); Omicron Delta Kappa National Honor Society, 2002; Mortar Board Honor Society, 2002; Blue Key Honor Society, 2002; Cardinal Key Honor Society, 2001; Golden Kay National Honor Society, 2001; and Alpha Lambda Delta National Freshman Honor Society, 2000. Ellis has served as Honors Program Student Association president since 2001, where she helps facilitate collaboration and team building among officers and represents the Honors Program to other organizations on campus and to the faculty. She is an officer of the Anderson Society, UA’s most selective honor society that initiates just 24 members annually, as well as many other clubs. She has taught Sunday school, is a member of the Presbyterian College Group, helped build a house in Los Angeles with Habitat For Humanity’s Alternative Spring Break and is a fellow with the Blackburn Institute, a student/faculty/alumni think-tank that each year studies a specific issue that affects Alabama. Ellis saw a need to help introduce honors freshmen to the university setting before the beginning of their freshman year so she created a program called Alabama Action. Because of her hard work and dedication to this project, she has delivered several national presentations on how to have successful honors program student associations and summer opportunities for honors students. The goals of Alabama Action are two-fold: first, to engage incoming honors freshmen in a period of sustained, substantive volunteer work in an underprivileged area; and second, to provide these incoming students with a first-rate academic introduction to poverty issues. During 2001, the Boys and Girls Club in Eutaw was refurbished, two donated computers were installed and students were tutored in an after-school program. In 2002, at Holt Elementary School in Tuscaloosa, the library was reorganized, an outdoor classroom setting was created, computers were procured, installed and networked and students worked with fifth-graders on conflict resolution. “It is no small feat that a student at a large state university could have organized disparate community leaders, earned the backing of the University president and administration and garnered financial backing on the strength of her idea alone,” said Dr. Fran Oneal, manager of the University Honors Program, in a letter nominating Ellis. Honored with the University’s Premier Innovative Service Award, Alabama Action is now a permanent part of the honors experience at UA. UA senior Allison Kellogg is most certainly worthy of the national honor she received in November 2002 – Point of Light Foundation National Volunteer of the Day. Her energy and enthusiasm has been felt in her hometown of Madison, Miss., and in her college town of Tuscaloosa through the important volunteer work she does. Her unending desire to give back to the community is a rare gift indeed. She has been able to turn her talent for dance into community-building activities and a way to connect with children from different backgrounds. In March of 2002 Kellogg received the Doublemint Aces For Campus Excellence Award, one of 50 national grants given from more than 14,000 applicants. The award was given for her work in providing underprivileged children with dance classes. She has received the James B. Rogers Jr. Mortar Board Scholarship, the Miss America Community Service Award, was invited to join Omicron Delta Kappa Society, Lambda Sigma, Cardinal Key and Blue Key, performed in the Alabama Repertory Dance Theatre where she spent 30 hours a week training, has served in several different offices in the Phi Mu social sorority and is a member of Dance Alabama, which raises funds for UA arts programs. Kellogg loves to work with children. She teaches free dance classes at the Tuscaloosa Boys and Girls Clubs through a program called “A Time To Dance.” She has several on-going school programs in Tuscaloosa and Madison, Miss., where she mentors students and classes. One of her programs is called Make A Difference Day. The student project “Reading for Refugees,” encouraged reading by raising funds to purchase blankets for Afghan refugee children. She also created a program called “Star Kids.” It teaches children how to use their gifts and talents to serve others in the community. She designed coloring books and program pamphlets and produced a video for the now copyrighted project. “Because dance gave me a focus and positive direction in my own formative years, I want to provide the same opportunity for any child who is interested in dance,” Kellogg said. Kellogg auditioned for the Radio City Rockettes Christmas Show in the early fall of 2002 and was chosen as an alternate cast member, quite an accomplishment for any dancer. Gabriel Walvatne is on his way to changing the way the Alabama’s justice system works. During his undergraduate years, and as part of his McNair Scholarship, he has conducted original survey research in criminal justice. His work will be published in UA’s “McNair Scholars Journal” this spring. He already has presented the results of his research at three professional conferences. He was allowed to enroll in a second and third year law class at UA’s School of Law for credit as part of the project. Walvatne has received numerous awards and honors: Academic Walk-On Scholarship, 2001-2003; Outstanding Sophomore; Samuel Thomas Barnes IV Memorial Scholarship, awarded by New College; McKinley Student Excellence Award; and the Phi Kappa Phi Honor Society, 2002-present. He’s a member of the Pre-Law Student Association; has been a member of the Alabama Model United Nations since 2000; participates in intramural sports; is on the New College Student Council; is a UA Ambassador, representing UA to prospective students, parents and special guests; volunteered for the Tuscaloosa Police Athletic League; and was asked to serve as a participant on the search committee for the director of UA’s New College in 2002. Walvatne also is a talented writer. This year he is the senior editor of the New College Review, a nonfiction undergraduate magazine written and produced by New College students. In this year’s issue he will have an article entitled “Societal Implants: The Makeover of the American Male,” which explores the increasing pressure on men to be cosmetically flawless. His major research, however, is into the issue of restorative justice, which is a movement in criminal justice to define crime as a personal harm and focus on the interaction of the victim and offender to repair that harm. Walvatne was not a believer in the practice until he met Montgomery circuit judge Tracy McCooey. McCooey started a Victim Offender Conferencing program where, quite literally, victims and offenders talk to each other about the crimes that have been committed. Walvatne wants to see that same approach adopted in Tuscaloosa. He began by studying the attitudes of Tuscaloosa County criminal justice professionals toward victims, offenders, the community and the criminal justice system. By comparing these answers to the restorative justice principles of the system, victims and offenders, he was able to determine if the participants would be open to this innovative approach to justice. He currently is preparing the results for publication. Laura Medders is a talented journalist and honors student who will use her gifts to help people change the direction of their lives and their circumstances. Her study of social inequality and educational gaps in the United States as part of her journalism major has prompted her to write for several publications both on and off campus. Through her Computer-Based Honors minor, she is developing a database and template for grant writing at the Tuscaloosa Family Resource Center. This will enable the agency to apply for larger and more complex grants with greater ease. She has received numerous honors and awards: First Place, Georgia Associated Press Association for Deadline Reporting, 2000; Randall Undergraduate Research Award, 2001; Journalism Academic Achievement Award, 2002; XXXI’s Women’s Honor Society, 2002, UA’s most prestigious women’s honorary recognizing leadership, service and outstanding achievements; and Outstanding Sophomore in the Computer-Based Honors Program, 2001. Medders has been involved in many programs at the University: service chair of the Alabama Student Society for Communication Arts; assistant copy editor for Dateline Alabama, UA’s student-run online daily news site; UA Athletic Hostess, 2001-02; Circle K International Service Club; Crescent East Housing Projects tutor; Holt Middle School’s GEAR UP Program tutor; A Time to Dance volunteer, a program that teaches jazz, ballet and modern dance classes to boys and girls in local housing projects; and Kid’s Club volunteer, an after-school program that provides games and recreational activities once a week to students in a housing project. In the summer of 2002, Medders chose to live and work as a part of the Desire Street Ministry, serving the Desire Street Project of New Orleans. She has been involved in many worthy research projects during her tenure at UA. Medders said the Desire Street internship removed the blinders she had to the social problems of this nation and it has affected every aspect of her academic endeavors. As part of an honors independent study she has explored issues of disparities in educational funding, poverty, social inequality and racism. She has conducted research on effective community development. Her career goal is to work in urban community development and inspire others to fight against social injustice.